Coventry Airport has been closed due to financial difficulties. West Midlands International Airport, which owns it, had been due to appear in the High Court on Wednesday to respond to a winding-up petition. The board and shareholders of the owners decided to shut it, an airport spokeswoman said. Passenger airline Thomsonfly stopped flights out of the airport in November 2008 and a year earlier the airport saw plans for a new terminal rejected. A public inquiry found the planned terminal would have created too much noise in the area. The airport has operated as a cargo terminal and a base for executive jets and aviation-related businesses since Thomsonfly ceased its operations there. City council leader Ken Taylor said it was a "real blow" to Coventry and he believed the city should have its own airport. He said: "We remain committed to the long-term future of the site as an airport and we will be doing all that we can to support the attempts to secure new ownership and on-going commercial management." Rob Davies, from HD Air, said he moved the company's business to Birmingham from Coventry airport at the beginning of November. He said: "We moved because we got a better deal and we were more comfortable with the management at Birmingham." The Civil Aviation Authority (CAA) said the airport's owner had issued a Notice to Airmen, informing pilots and aircraft that the airport was no longer operational. 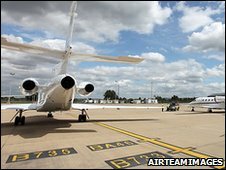 It said air traffic control at the airport had also ceased operating and overflying flights would be handled by other airports in the area, including Birmingham. Coventry North West MP Geoffrey Robinson said he was surprised by the news and had spoken to the owners and unions. He said he would be discussing the development with the Department for Transport. A spokeswoman for Coventry Airport issued a short statement. She said: "The board and shareholders of West Midlands International Airport Limited have made the decision to close Coventry Airport with immediate effect." The airport was opened in 1936 and used as an RAF base during World War II when it was damaged by enemy bombing.